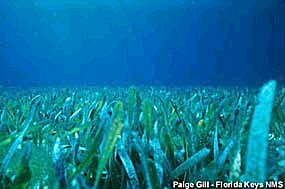 Seagrass growing off the coast of the Florida Keys. The benthic zone is one of the ecological regions of a body of water. It comprises the bottom—such as the ocean floor or the bottom of a lake—the sediment surface, and some sub-surface layers. Organisms living in this zone—that is, on or in the bottom of the body of water—are called benthos. The adjective benthic refers to something connected with or occurring on the bottom of a body of water (CSC 2008). In contrast, the pelagic zone is the descriptive term for the ecological region above the benthos, including the water-column up to the surface. The terms benthic and benthos are derived from the Greek for "depths of the sea" (CAML 2008), but the terms are also used in freshwater biology to refer to the zone and organisms at the bottoms of freshwater bodies of water, including both standing and running waters, including lakes, rivers, and streams (NABS 2008). The benthic zone provides many valuable products and ecological services. Benthic organisms play an important role in food chains, including as food for humans, and some play a critical role in the breakdown of organic matter (CSC 2008). Some benthic zones, such as areas of coral reefs, kelp forests, and eelgrass beds, help to buffer wave action along coastlines, providing storm protection (CSC 2008). The benthic zone provides an area for spawning, foraging, and refuge for various fish species, and benthic habitats function in nutrient cycling and removal of contaminants from the water, such as with the removal by filter feeders (scallops, mussels, and so on) of pollutants, organic matter, and sediments (CSC 2008). The diversity of these habitats and their organisms also add to the delight and mystery of nature for humans, whether it is through the beauty of a coral reef, the observation of a sea anemone on the ocean floor, or the sighting of a new creature in the exploration of a deep ocean habitat. The benthic zone refers to both freshwater, brackish, and saltwater environments. Depending on the water body, the benthic zone may include areas that are only a few inches below water, such as a stream or shallow pond, or may be at the bottom of an ocean below a 4,000 meter (13,000 foot) column of water. Benthic habitats are very diverse, depending upon their depth and location and have distinct biological, physical, and geochemical characteristics (CSC 2008). The superficial layer of the soil lining the given body of water is an integral part of the benthic zone, as it influences greatly the biological activity that takes place there. Examples of contact soil layers include sand bottoms, rock outcrops, coral, and bay mud. Estuarine and nearshore benthic habitats include coral reefs, kelp forests, shellfish beds, shallow submerged mudflats, rocky hard-body habitats, and rippled sandflats (CSC 2008). The abyssal zone—the pelagic zone, from 2,000 to 6,000 meters in depth—remains in perpetual darkness and never receives daylight. It contains the very deep benthic communities near the bottom of oceans. The abyssal zone has temperatures generally around 0 to 3°C, but 13-15°C in the Mediterranean sea. Abyss is from the Greek word meaning bottomless sea. The bottoms deeper than the abyssal zone occupy the sparsely inhabited hadal zone, with the name derived from Hades, the classical Greek underworld. The bottom areas lying at lesser depths than the abyssal zone occupy the bathyal zone. These three zones belong to the deep-sea realm. The hadal, abyssal, and bathyal zones are in such relatively deep, high pressure areas of the ocean, that they and their organisms are difficult to observe and map. The deep trenches or fissures that plunge down thousands of feet below the ocean floor—for example, the midoceanic trenches such as the Mariana Trench in the Pacific—are almost unexplored. Only the bathyscaph Trieste and the remote control submarine Kaiko have been able to descend to these depths. The pelagic zone, the open-ocean zone that includes the water-column above the benthos to the surface, is similarly divided into subzones, such as the epipelagic (surface to around 100 meters), mesopelagic (twilight zone from 200 meters to around 1,000 meters), bathypelagic (about 1,000 meters to 4,000 meters), abyssopelagic (4,000 meters to above the ocean floor), and hadopelagic (deep water in trenches). In contrast to the organisms of the benthic zone, which tend to be constrained to remain close to the bottom, organisms in the pelagic zone tend to move much more freely and widely. These include the various types of Plankton, which move passively as they are carried by water currents, and the various types of nekton, which can swim against the current and control their position. Microphotograph of some benthic animals. Giant clam along the Great Barrier Reef. Benthos are the organisms living in the benthic zone—that is on or in the bottom (substatum) of water bodies, and some would add those near the bottom (NABS 2008). These organisms generally live in close relationship with the substrate bottom; many such organisms are permanently attached to the bottom. Many organisms adapted to deep-water pressure cannot survive in the upper parts of the water column. The pressure difference can be very significant (approximately one atmosphere for each ten meters of water depth). The benthos can be categorized in various ways. One division classifies the primary producers (algae, aquatic plants) living on the bottom as "phytobenthos" and all consumers (protozoa and benthic animals) living on or near the bottom as "zoobenthos" (NABS 2008). The term epibenthos is used for those organisms living on top of the sediment and hyperbenthos for those living just above the sediment. These dimensions vary from researcher to researcher, with some accounts using a cutoff of 45 μm between meiobenthos and microbenthos and some even one tenth of a millimeter (NHPTV 2008). For example, some define meiobenthos as those organisms that can pass through a one mm mesh but will be retained by a 45 μm mesh. Whether an organism will pass through a one mm mesh will also depend upon whether it is alive or dead at the time of sorting. Large invertebrate benthic organisms, which may be known as macrobenthos, macrozoobenthos, or macroinvertebrates (NABS 2008), include such marine examples as sea stars, oysters, clams, sea cucumbers, brittle stars, and sea anemones, and such freshwater examples as snails, crayfish, and the larva of many aquatic insects (dragonflies, mayflies, caddisflies). A microscope is required for viewing the microbenthos, which include diatoms, bacteria, and ciliates (NHPTV 2008). The term meiobenthos was first coined in 1942, by M.F. 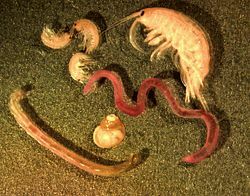 Mare, but organisms that would fit into the meiofauna category have been studied since the eighteenth century. They may include some sea spiders, sea worms, and water bears. The benthic fauna is very diverse. Smith (1996) notes that faunal composition and diversity increases with depth until the mid or lower bathyal region, then decreases toward the abyssal plain. 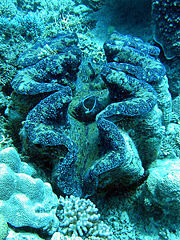 Bottom organisms tend to have four feeding strategies (Smith 1996): filtering suspended material from the water (for example, coelenterates), collecting material that has settled on the sediment surface (ex., sea cucumbers), deposit feeding (for example, polychaetes), and predatory (for example, brittle stars). Because light does not penetrate very deep ocean water, the energy source for the benthic ecosystem is often organic matter from higher up in the water column that drifts down to the depths. This dead and decaying matter sustains the benthic food chain; most organisms in the deep water benthic zones are scavengers or detritivores. Census of Antarctic Marine Life (CAML). 2008. Benthos. Census of Antarctic Marine Life. Retrieved April 18, 2008. Coastal Services Center (CSC), National Oceanic and Atmospheric Administration (NOAA). 2008. B What is benthic habitat? National Oceanic and Atmospheric Administration. Retrieved April 18, 2008. Mare, M. F. 1942. A study of a marine benthic community with special reference to the micro-organisms. Journal of the Marine Biological Association of the United Kingdom 25: 517-554. North American Benthological Society (NABS). 2008. What is the "benthos" and what do benthologists do? North American Benthological Society. Retrieved April 18, 2008. Smith, R. L. 1996. Ecology and Field Biology, 5th edition. HarperCollins College Publishers. ISBN 0065009762. This page was last modified on 21 January 2013, at 22:34.